This entry was posted on April 3, 2011 by lds architecture. It was filed under Chapel Interiors, Farmington Ward, Meetinghouses, United States and was tagged with Chapel Interior, Farmington, Farmington Ward, Meetinghouse, Utah. I really like how the pulpit is positioned to the left. And of course the mural is fantastic! Is that Eliza R. Snow I see? I absolutely love the side pulpit as well and the design of it is quite nice also. I’ll post a close-up of it shortly. Is there information of when this mural was painted and displayed in the Farmington Ward chapel? I was a young girl living in Farmington and it seems to me the mural was painted by Lynn Fausett in the 40’s. Is this correct? Also are there printed photo copies of this chapel scene that one can purchase? I’m still trying to track this one down, Joan. I don’t know off the top of my head, but will look further into it. There wasn’t an artist name on the mural that I was able to find. Nor did I see a date. I’ll try and see if there is anything in the copies of the plans that I have. Thank you – I have contacted the history center at the Rio train station in SLC. Also the Harld B Lee Library in Provo. The HBL has photos of the mural but they will not photo copy them. Also, the artist I think also painted the “last wagon.” and murals in Washington D.C. and for the Utah state capitol. Bishop John Walsh was the ward bishop at he time the Primary mural was painted. It is very difficult to locate info concerning those who were decipted in the mural. The lady in gray is Eliza R Snow? The one in brown A Rogers? The reason I am franticaly researching the history of the mural and the 1st Primary is that I am writing a script for a play that will be presented in September in our ward at Twin Falls, Idaho. The mural in the Rock Chapel was painted by Lynn Faucett. It was dedicated by Charles A Callis, apostle, November 24, 1941. John Walsh was bishop of the Rock Chapel at the time. Thanks so much for sharing your findings, Joan! Does anyone know where a photo of the Primary mural can be obtained? The Harold B Library at Provo Utah has a photo but they cannot give copies because of copyright etc. The woman in gray standing in front of the pulpit is Aurelia Rogers. In a historic photo of her taken about the time of the organization of the Primary, she is wearing a dress with a long white lace bib with a pin or brooch the same as in the mural. 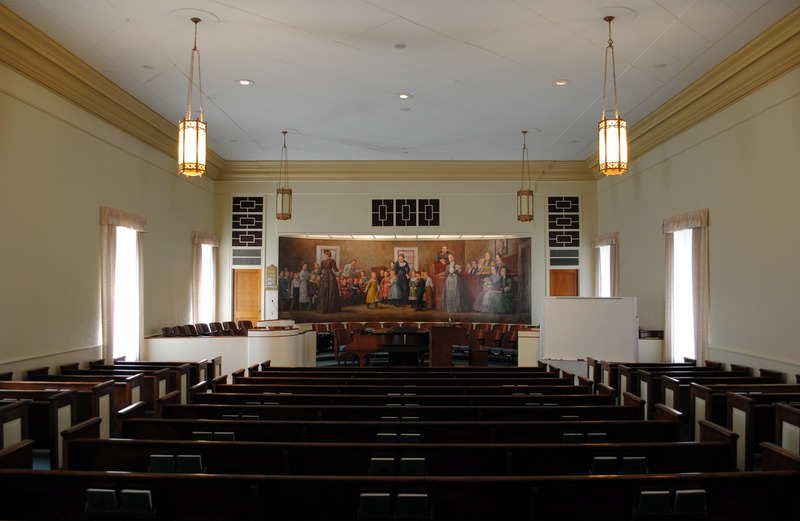 I suspect one of the women sitting behind the pulpit is a portraiture depicting Eliza Snow as the two women sitting in front of the mural to the right most likely are Rogers two councilors. Who the woman in brown facing facing the congregation of children is unknown as is the other woman guiding the children. Too bad details of this mural are not readily available – or have been preserved? In 1976 a woman named Margaret Steed Hess, daughter-in-law and niece of Bishop John W. Hess, authored a book entitled MY FARMINGTON 1847 – 1976. In her book, she has information about the mural and its dedication on 24 August 1941, the 117th birthday of Bishop Hess. The artist was Lynn Fausett. Bishop Hess was bishop of the Farmington Ward when he called and set apart Aurelia Spencer Rogers as the first Primary President. Bishop Hess is pictured at the podium in the mural. Margaret Steed Hess has included a picture of the mural on page 301 of her book. She was a child at the time of the first meeting of the Primary and identifies herself and many others depicted in the mural. Aurelia Spencer Rogers is the lady standing near the podium. To the right are two women, one holding a baby. The woman and the baby are described as “fill ins.” Elizy R. Snow is seated beside her. The Church used to publish card-sized and poster-sized pictures of the mural for use in Primary. I don’t know if they are currently available. Bishop Hess was my 3rd greatgrandfather. Very few of the children are identified in the mural. There were 112 boys and 112 girls, ranging in ages 6 to 14, that attended the First Primary. Mr. Fausett simply did a “representation” of children during that period of time, and then painted in a few of the children that he’d been given pictures to go by. In Aurelia Rogers’ book, Life Sketches, she listed names of each of the children. If anyone is interested in a copy of the list, and would like a copy of a brief history of the Rock Chapel and the First Primary, I’d be happy to email them to them. I live in Farmington and attend the Rock Chapel, and I’m Executive Director of the Farmington City Historic Preservation Commission. You can contact me at a2ztidwell@msn.com. I was born, raised and still live in rural Rigby, Idaho. I first saw this mural many years ago as a child, while at a Christensen family reunion in Farmington. The gentleman with the white beard and mustache sitting behind the pulpit is my great-grandfather, Mads Christensen. He assisted in the building of the chapel, and was asked to assist in the meeting depicted in the mural. For years the only picture that my family had of the mural was a black-and-white copy of a copy of a copy … Before our children were grown we took them to see this historic chapel. My son who lives in Boise, Idaho, recently went back to the chapel, He is a free-lance photographer, and when he told the guide that he was a descendent of Mads Christensen, the guide gave him permission to take photos. Now I have beautiful COLOR copies of those pictures. Any chance of getting a copy of some of the pictures your son took? The man standing in the pulpit is John W. Hess, my second great-grandfather. My name is Jay Dee Hendricks (see above comment of June 19, 1912). My great grandfather was John Harvey Tippets (of the Mormon Battalion and The First Company). He settled in Farmington and is buried there. I was told many years ago, that my grandfather, Joseph Alva Tippets (John Harvey’s youngest child) was one of those depicted in this mural. My father, Joseph Henderson Tippets, was Joseph Alva’s youngest (eighth and only son). Does anyone know when the church published this picture in postcard form? Are they still for sale today. I found some in my mother’s home and am looking into why she would have them.